The Interdisciplinary Maternal Perinatal Australasian Collaborative Trials (IMPACT) Network was formed in 1994 within the then Australian Perinatal Society and in 1997 became a subcommittee of the Perinatal Society of Australia and New Zealand (PSANZ) dedicated to improvement of maternal and perinatal health by promoting well-designed randomised controlled trials (RCTs), and dissemination and application of their results. This website has been developed for investigators, health care professionals and consumers to learn more about the conduct of clinical trials, the clinical trials in maternal and perinatal health taking place across Australia and New Zealand, and how the IMPACT Network for Improving Mothers and Babies Health can facilitate the design and set-up, execution and timely completion of these trials. Do you have an Idea for a Clinical Trial? Then you will be interested in The IMPACT Network Trial Concept Development Workshop! At the workshop, we will discuss trial concepts from ideas through to structured plans for large collaborative multicentre clinical trials. We encourage you to submit your ideas even if all the details are not yet ironed out. This is an ideal opportunity to get input and guidance. The end result may be a pilot study, trial protocol or a funding application. This highly interactive and collaborative workshop aims to further development of clinical trials within the IMPACT Network. The workshop will be guided by highly experienced facilitators. In addition, interested investigators will convene from all over Australia and New Zealand to provide information, advice and guidance. Faculty specific to concepts will be announced closer to the meeting. To compare the effects of delayed versus early cord clamping on hospital mortality (primary outcome) and morbidity in preterm infants using Cochrane Collaboration Neonatal Review Group methodology. MEDLINE, EMBASE, Cochrane Central Register of Controlled Trials and Chinese articles, cross-referencing citations, expert informants and trial registries to 31 July 2017. RCTs of delayed (≥ 30 seconds) vs early (<30 seconds) clamping in infants born <37 weeks gestation. Before searching the literature we specified that trials estimated to have cord milking in >20% of infants in any arm would be ineligible. Two reviewers independently selected studies, assessed bias and extracted data. Relative risk (i.e. Risk Ratio, RR), risk difference (RD) and mean difference (MD) with 95% confidence intervals (CI) were assessed by fixed effects models, heterogeneity by I2 statistics and the quality of evidence by Grading of Recommendations Assessment, Development and Evaluation (GRADE). Eighteen RCTs compared delayed vs early clamping in 2834 infants. Most infants allocated to have delayed clamping were assigned a delay of 60 seconds or more. Delayed clamping reduced hospital mortality (RR 0.68, 95% CI 0.52 to 0.90; RD -0.03, 95% CI -0.05 to -0.01, P=0.005; number needed to benefit 33, 95% CI 20 to 100; GRADE high, with I2=0 indicating no heterogeneity). In three trials in 996 infants ≤28 weeks gestation, delayed clamping reduced hospital mortality (RR 0.70, 95% CI 0.51 to 0.95; RD -0.05, 95% CI -0.09 to -0.01, P=0.02, number needed to benefit 20, 95% CI 11 to 100; I2=0). Subgroup analyses showed no differences between randomized groups in Apgar scores, intubation for resuscitation, admission temperature, mechanical ventilation, intraventricular hemorrhage, brain injury, chronic lung disease, patent ductus arteriosus, necrotizing enterocolitis, late-onset sepsis or retinopathy of prematurity. Delayed clamping increased peak haematocrit by 2.73 percentage points (95% CI 1.94 to 3.52; P<0.00001) and reduced the proportion of infants having blood transfusion by 10% (95% CI 6 to 13%, P<0.00001). Potential harms of delayed clamping included polycythemia and hyperbilirubinemia. This systematic review provides high quality evidence that delayed clamping reduced hospital mortality, which supports current guidelines recommending delayed clamping in preterm infants. This review does not evaluate cord milking, which may also be of benefit. Analyses of individual patient data in these and other RCTs will be critically important in reliably evaluating important secondary outcomes. We applied the methods of the Dutch researchers to exploring the health outcomes and costs of treatment interventions in maternal and perinatal health that have been evaluated in randomised clinical trials (RCTs), and calculated the potential cost savings and improved patient outcomes achievable by implementing efficacious treatment interventions. Congratulations to William Tarnow-Mordi, his team and all members of the IMPACT Network who were involved with the BOOST II Trial. They were awarded First Runner Up in the Australian Clinical Trials Alliance (ACTA) Trial of the Year Award 2017. 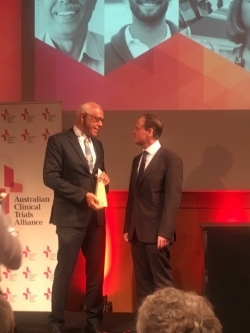 This prestigious award was announced along with the winner at the Clinical Trials National Tribute and Awards Ceremony held in Sydney on Friday 19th May. This is a fantastic achievement for the trial investigators and great news for the IMPACT Network. Following on from the win by the PPROMT trial last year it is absolutely awesome to again see maternal and perinatal health blazing the trail of clinical trials. William Tarnow-Mordi receiving the award from Minister Greg Hunt. 19th May was a big day for clinical trials research in Australia as Minister Hunt took the opportunity of the awards ceremony to announce the allocation of $33 million from MRFF and other sources to support clinical trial research. Most significantly this included $5 million to ACTA over the next four years to ‘support their work in ensuring Australia maintains its world-leading clinical trial standards and continues to support the clinical trials sector’. This is unlikely to involve any finances reaching clinical trials networks directly but will still provide support for the work we do and is a big signal for future support of clinical trials.